In their 11th annual review of oil sands supply costs, the Canadian Energy Research Institute (CERI) pegs breakeven costs at $43.31/bbl for SAGD projects (steam-assisted gravity drainage) and $70.08/bbl for a stand-alone mine. 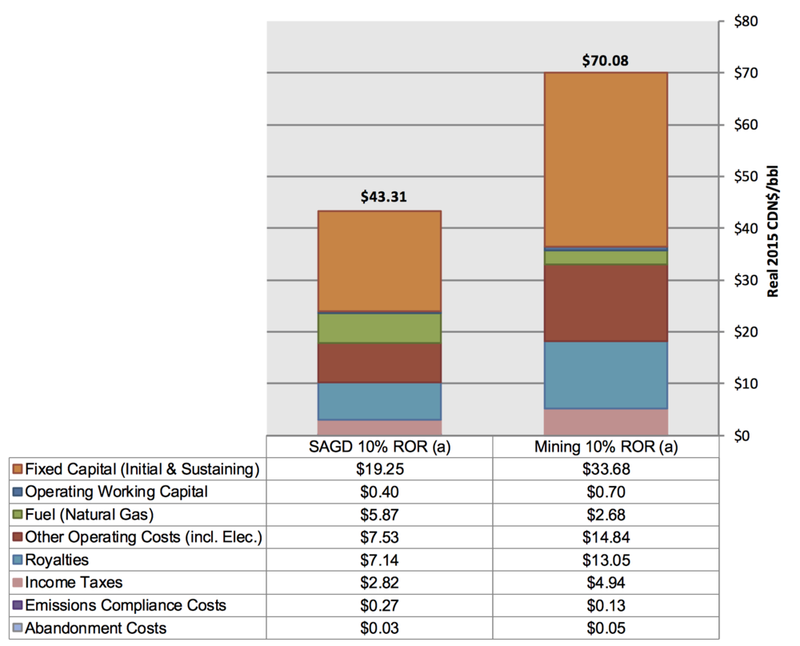 The figures exclude blending and transportation costs but include capital expenditures. The higher mining costs stem from higher capital requirements, higher non-fuel operating costs and higher royalty payments. CERI says those figures are down 27% for SAGD and 6% for mining operations, relative to their last update in August 2015. Factoring in blending and transportation, WTI equivalent costs increase to US$60.52 for SAGD and US$75.73 for a stand-alone mine. Those numbers are down 25% and 16%, respectively. The big jump in SAGD breakeven costs reflect the high price of diluent required to blend the bitumen product. Diluent (typically condensate) trades almost at par with WTI. CERI therefore concludes that no greenfield oil sands project is economically feasible under the current pricing environment. However, the author concedes the same could be said for any new oil development around the world, and profitability will improve considerably when (not if) oil prices eventually recover.